Adding new functionality to your Content Cloud installation is as easy as 1-2-3! 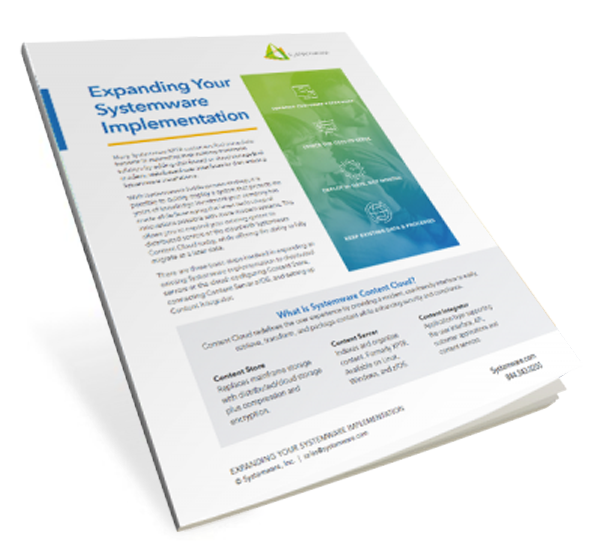 Many Systemware XPTR customers find immediate benefits in expanding their existing mainframe solution by adding distributed or cloud storage and modern, web-based user interfaces to their existing Systemware installations. With Systemware’s battle-proven strategy, it is possible to quickly deploy a system that protects the years of knowledge investment your company has made while leveraging the latest technological innovations possible with more modern systems. This allows you to expand your existing system to distributed servers or the cloud with Systemware Content Cloud today, while offering the ability to fully migrate at a later date. Where are you in your digital transformation journey?